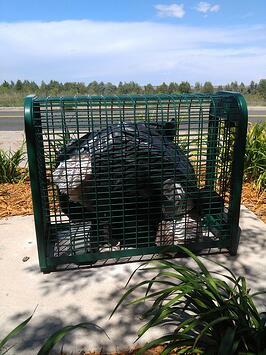 You may be surprised to learn that cages are very popular throughout Colorado and the surrounding areas. Larger backflow preventers are typically installed in vaults or inside, but the devices for irrigation and some domestic lines end up outdoors. There are a lot of parks, golf courses, and schools that use 3", 4" or even 6" RPZ backflow preventers which are installed outside. How is this possible when much of Colorado has more than 100 days per year where the temperature is around or below freezing? 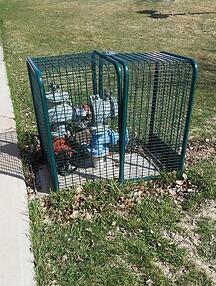 The backflow devices inside cages need to be "winterized" each year. This involves the owner doing one of two things. Either the community or building utilizing the irrigation valves will turn off the line and physically remove the valve, or they will insulate it with another product. The easiest way to winterize backflow preventers is to purchase something with which to insulate it. There are insulating bags, sometimes called blankets, on the market that will fit on small backflow valves for less than $100. They are advertised as having an R-13 insulation factor, but don't have specific information about what temperature they will maintain in cold weather. A popular brand of these bags claims they should last for two years. You can read all the details mentioned on this product page. The other method of winterizing is to stop the water line and remove the devices that could freeze. Some opt to do this themselves, mostly the handier homeowners. Here is an outline of how this is done from SprinklerWarehouse: Turn off the Water, Shut Down the Controller, Drain the Water. There are a couple different ways that draining the water from the lines, sprinklers, and backflow device itself and if you're looking for exactly what to do, please visit the SprinklerWarehouse website. The point is, it's not as easy as some may think. Most will end up hiring a professional to get it done, which is safer, but that certainly makes it more costly. The problem with winterizing, whether you're adding insulation each year or removing the valve, is that Mother Nature is unpredictable. When is the right time to winterize backflow preventers and what happens if you're too late? It's difficult to know the right time of year in areas such as Colorado. In Denver, the months with the highest amount of snowfall are March and April. There are often storms throughout the state as late as June and as early as October. Driving around Colorado, it's easy to tell that some have felt frustration from this and left insulating bags on their devices year round. As you can see in the image to right, that isn't always pretty. If you're using the more reliable method of shutting down the line and removing the valve, you don't even have that luxury. This isn't just an issue in states with characteristically cold climates. In January of 2018, much of the southeastern United States as well as Texas froze. We received calls and reports from our local reps about many devices leaking after the freeze. Had those backflow preventers been inside enclosures with heaters, there would have been fewer problems. Backflow cages have no insulation at all to provide frost or freeze protection, but do provide some vandal, accident and thief protection as they are powder coated steel and do include a locking mechanism. Cages used to be a less expensive alternative, but are now about the same price as an aluminum enclosure. They are useful in warm environments that do not have below freezing temperatures, but there is always a chance that the weather will do something unexpected as outlined above. If you can plan for bad weather and winterize, and backflow cages are significantly less expensive than enclosures in your area, then a cage may be for you. Weigh your options because it's up to you to choose the level of protection your equipment needs and think about the time and resources you're willing to spend over the years. Using backflow cages in colder climates like Colorado is doable but does take extra planning, money, and work. If you were to choose an insulated or heated enclosure instead, you'd have protected valves year round, possibly for decades, without any extra thought or work needed.